Caring for little kids during cold and flu season is something teachers are expected to do, even if they have a cold too! You can help them get through the day with this Cold Survival Kit for teachers. The kits include a DIY shower vapor disk and lip balm, together in a small bag with printable gift tags. 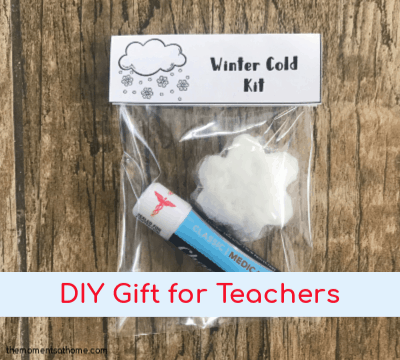 What I like about these homemade teacher gifts is that kids get to make something for their teachers, and that means more to the person receiving the gift. I also think kids love knowing they made something special for their teachers, and a store bought present just doesn’t have the same feeling. 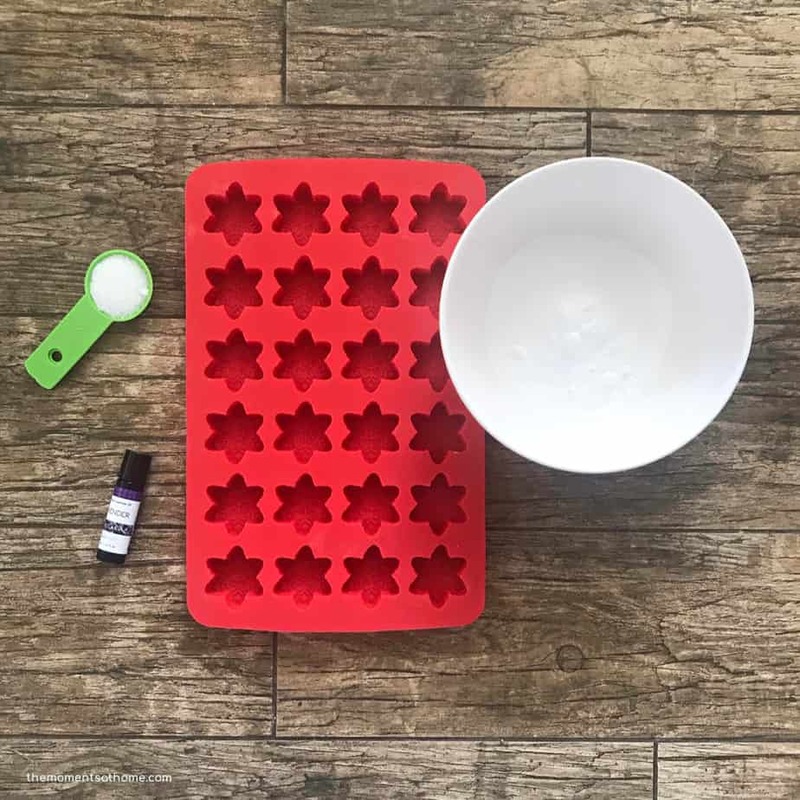 Don’t get me wrong, if you don’t have time for a DIY teacher’s gift, store bought shower melts are okay too! But this blog is about spending time together at home creating special memories. Making presents for teachers is a fun family activity! Scroll down after the post to see more DIY gifts kids can make! Mix together the corn starch and Epson salts. Add water slowly until the mixture has the consistency of peanut butter. Spoon the mixture into the baking mold. Add 2 drops of essential oil to each disk and mix slightly with a fork to move the oil around. Let the disks dry 24 hours or until firm. Refrigerating the disks can speed up the setting process. Remove them from the mold and store in a covered container. Print the gift tags and shower disk labels. Cut the tags and labels out and set them aside. Wrap the shower disk in a small square of plastic wrap. Glue the label to the back. Add the shower disk and lip balm to the treat bag. Fold the gift tag in half and glue it on the bag. Give the Winter Cold Survival Kit to your child’s teacher as a gift, or anyone else that could use a little help this winter! This post is part of the DIY Kid-Made Gifts Series from Teach Me Mommy. Check out yesterday’s DIY posts below! I bet any teacher will love this! Thanks for sharing it during our Kid-made Christmas series!